It has been shown to work on the i9023 variant, and we're currently trying to figure out whether it works on different flavors of the i9020. If you have the Nexus S 4G on Sprint, sorry, this update is definitely not for you - you have access to 4.0.4 already anyway. 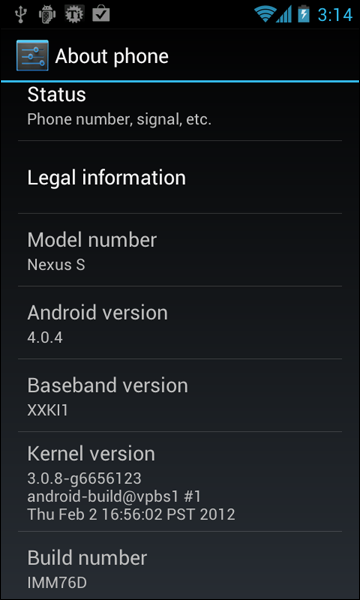 And, of course, if you have the Verizon Galaxy Nexus, your 4.0.4 update leaked last month here. Update: A user on XDA reported success flashing this on the T-Mobile Nexus S (of course, you still need to be on 4.0.3 for it to work), but we haven't been able to confirm with our Nexus, which fails with an assert. Update: It looks like updates on Nexus devices without SD cards can not be performed manually unless you either root or use a custom recovery, like CWM - otherwise, you'll get the errors many of you are seeing. It seems to be happening because the OTA files check whether they're located in /cache, which isn't writable unless you root or receive a proper OTA. JBQ himself confirmed it, but said it wasn't on purpose. The preferred solution seems to be using a custom recovery, then installing the above update. Galaxy Nexus has a similar problem, so you're not alone.